From the "where there's smoke there's likely fire" department: Non-energy commodity prices are up 30% year to date, Caterpillar stock is up over 50% from its January lows, and global equity prices—as well as the S&P 500—are up almost 20% from their February lows. Something's happening out there, and it looks promising. 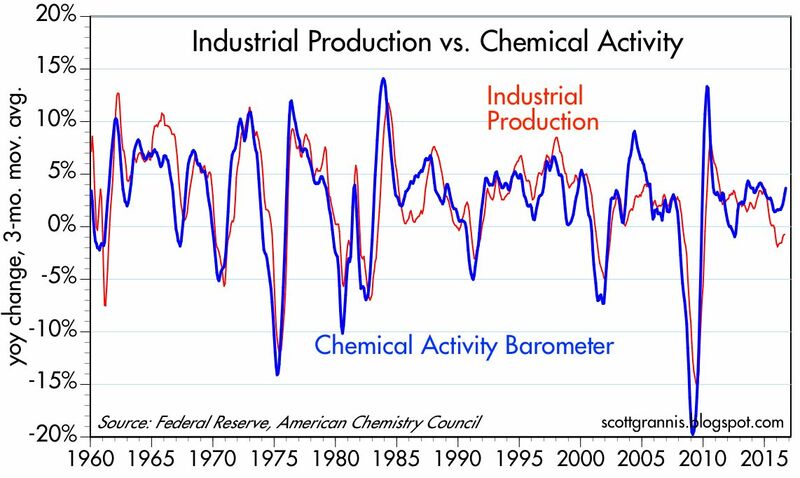 Most likely, global economic activity is picking up, and cheaper (and more stable recently) oil prices could be the reason. 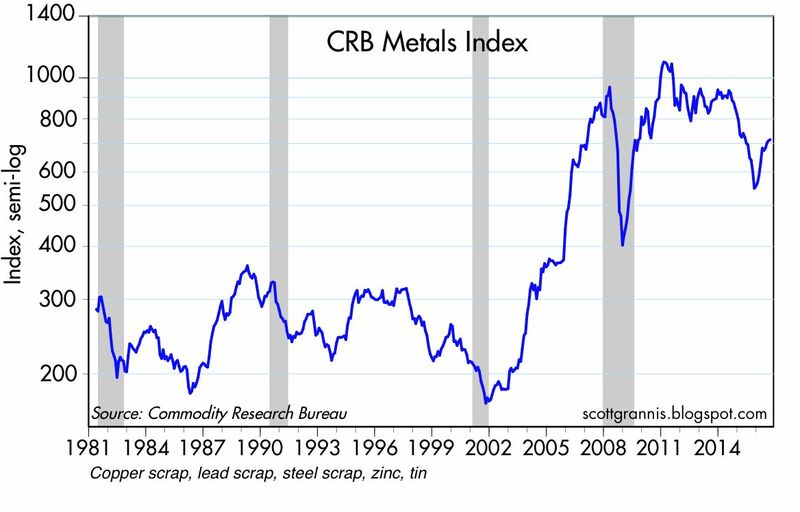 The chart above compares the CRB Metals index (copper scrap, lead scrap, steel scrap, zinc and tin) to the price of Caterpillar stock. Both have traditionally moved together, and the past year or so is no exception. Global mining activity looks to be picking up, and so it's a good bet that global activity in general is on the mend. This supports my forecast over the past six months that we are likely to see some stronger GDP numbers for the second half of this year. It's nothing to write home about yet, but any improvement from the 1.1% annualized growth rate of the first half (which includes today's modest upward revision to second quarter growth) is certainly welcome. 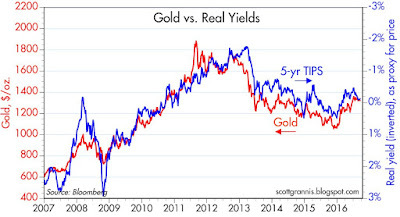 The chart above shows a longer-term view of metals prices. 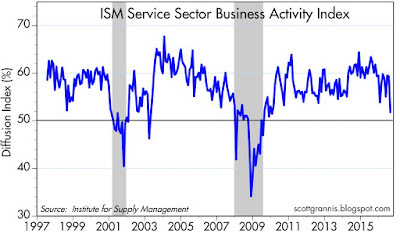 They do tend to soften during periods of economic weakness, and they do tend to rebound as activity recovers. The chart above compares the level of US stock prices to the ratio of the 10-yr Treasury yield to the Vix index (which ends up being a proxy for the market's nervousness and confidence in the outlook for growth—a higher number reflecting more nerves and less confidence, and a lower number reflecting less nerves and more confidence). 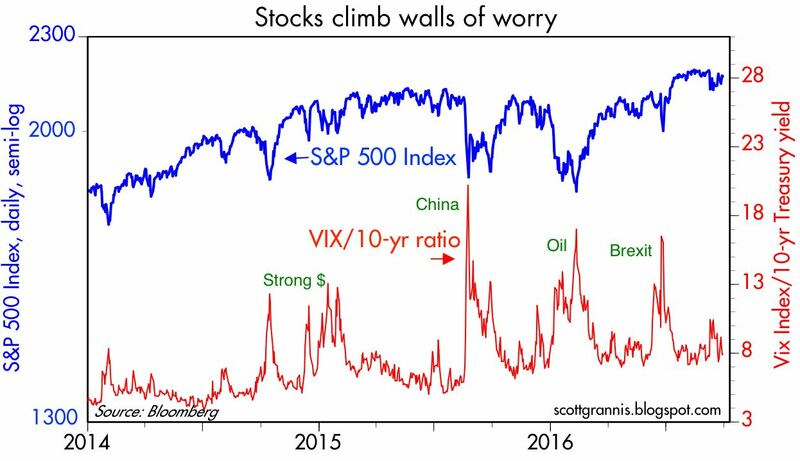 In the past year the market has overcome fears related to collapsing oil prices and the British decision to exit the European Union. 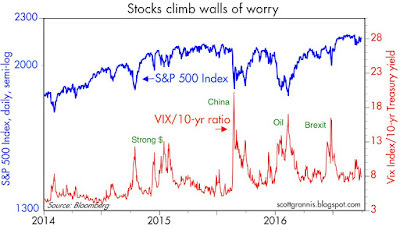 It now feels like we're in a holding period, in which activity has recovered somewhat from a fear-induced slump, but nothing is going gangbusters yet. If there is to be any meaningful surge in activity on the horizon, it will likely require a satisfying and confidence-building resolution to the US elections which are coming up in just over 5 weeks. I think that, in turn, would require a Trump victory, since he would almost certainly work with Congress to reduce tax and regulatory burdens. If nothing else, a significant reduction in the corporate income tax rate could unleash a tidal wave of profits repatriation and a subsequent surge in corporate investment. At the very least, there is reason to remain optimistic. The CAB index is up 4.1% in the past year, for the best showing in the past two years. 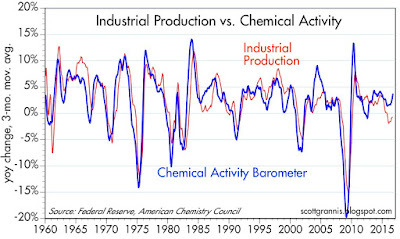 This suggests that the oil production slump is washing out of the data, and cheaper oil prices are resulting in stronger production of related chemicals. 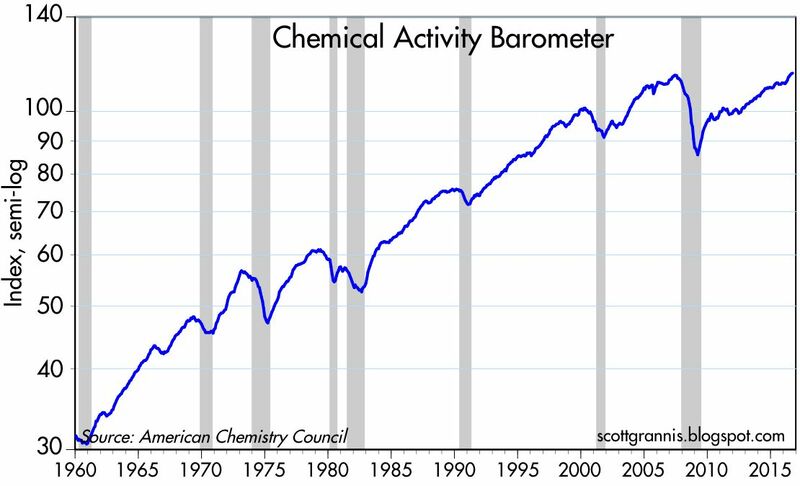 The year over year change of the 3-month moving average of the index is now up to 3.7%, and a similar measure of industrial production is showing an uptick as well, and that is in line with historical experience—with chemical activity tending to lead industrial production. 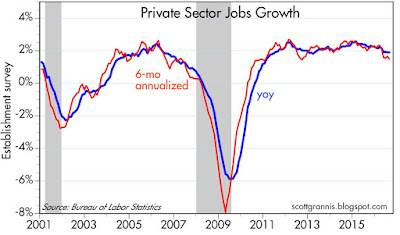 I'm not convinced any of this points to a significant acceleration of economic growth. But it does argue convincingly that the economy is not turning down or slumping. 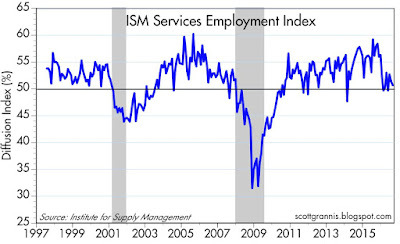 Most likely, it just means that the economy is still growing slowly but on the margin it is doing slightly better. For more detailed information, see Calculated Risk. This year marks the 100th anniversary of the US estate tax, which affects only the ultra-wealthy. –Not true. Narrowly defined, the US estate tax affects only people whose estate currently exceeds $5.45 million, or couples whose estate exceeds $10.9 million. However, that is hardly a reasonable definition of "ultra-wealthy" in a era when it takes a net worth of at least $1.7 billion to make the Forbes 400 list. More broadly, the estate tax affects anyone who is wealthy or hopes to one day become wealthy—and those are the people who are most likely among the most productive members of society. The estate tax is effectively a punishment on success, since it amounts to the legalized theft by the state of money people have worked hard to accumulate, and upon which they have already paid tax at least twice (once when they paid income tax on their earnings, and a second time when the equity investments they made with their after-tax earnings had their profits taxed). Punishing success is like cutting off your nose to spite your face. There is no productive activity in inheriting a large sum of money, so it does little to distort the economy. -On the contrary, the estate tax creates huge distortions in the economy. How else to explain the virtual army of accountants and lawyers who toil to reduce the estate tax liabilities of their clients? How else to explain why the insurance industry—which sells a legal run-around to the estate tax in the form of life insurance policies—fights so hard to keep the estate tax in place? How else to explain why today's mega-billionaires (e.g., Bill Gates and Warren Buffett) are directing that their estates be donated to charitable foundations? I don't know anyone who wants to give almost half of the wealth they have accumulated after a lifetime of work to the government. Historically such taxes have worked well in the United States, raising revenue and redistributing wealth. -No, the estate tax has hardly worked at all. In the most recent 12 months, the federal estate tax generated revenues of only $21.4 billion, a paltry 0.6% of total federal revenue. How does redistributing $21 billion qualify as income redistribution, when personal income is currently running at a $16 trillion annual rate? 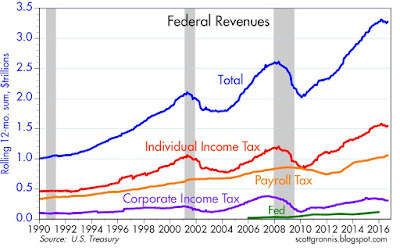 How can anyone justify having a behavior- and economy-distorting tax that redistributes only 0.13% of total income? How well will the mega-billion Gates Foundation fight inequality, when it is extremely likely that it will spend only 5% per year of its endowment on charitable activities (the legal minimum required of any charitable organization)? No one really knows, but that doesn't seem to worry the people who defend the estate tax. The author laments the fact that the estate tax has been reduced in recent decades, erroneously claiming that the estate tax generated $216 billion in 2001, when in fact it generated only $28.2 billion at a time when personal income was $9 trillion (0.3%). In the past 35 years, the estate tax has never generated more than 0.35% of total personal income in any one year. The author further erroneously claims that the estate taxes collected in 2001 could cover the cost of food stamps "14 times over." That is wildly off the mark, since the total cost of food stamps in 2001 was $18 billion, whereas estate tax revenues were $28.2 billion. If we eliminated the estate tax in its entirety, the economy would most likely strengthen, living standards would rise, and the impact on the federal deficit would be nil. Eliminating the estate tax would increase people's incentives to invest and accumulate wealth—wealth which is enjoyed by everyone, just as we all benefit from the fruits of successful companies. And with increased wealth and incomes, federal revenues would increase. By making this assertion, I rely on nothing more than my strongly-held belief that people are able to invest their own money much more efficiently and productively than government bureaucrats and politicians can. Clinton proposed raising estate taxes. I understand that issue and I view it as robbery by government. ... under Clinton’s plan, estate taxes would be higher for anyone with estates over $5 million(ish). I call this a confiscation tax because income taxes have already been paid on this money. In my case, a dollar I earn today will be taxed at about 50% by various government entities, collectively. With Clinton’s plan, my remaining 50 cents will be taxed again at 50% when I die. So the government would take 75% of my earnings from now on. You can argue whether an estate tax is fair or unfair, but fairness is an argument for idiots and children. Fairness isn’t an objective quality of the universe. I oppose the estate tax because I was born to modest means and worked 7-days a week for most of my life to be in my current position. We're in Argentina this week and next, visiting friends and relatives and looking forward to a big wedding this weekend that will be attended by 500+ people. Spring has just arrived, and the people and food are fantastic as always. Food, wine, lodging and taxis are delightfully cheap for American visitors, and now you can easily pay for things with credit cards or withdraw pesos from an ATM (last year both methods were subject to an unfavorable exchange rate), since money is freely exchangeable at a single rate (currently about 15 pesos to the dollar). There have been many welcome improvements since Macri took over the reins of government from Christina Kirchner late last year. Unfortunately, there are still many head-scratchers: Argentina has uniquely refused to allow Uber to operate within its borders (hint: the taxi cartel is very powerful); it's impossible for Argentines to buy books from Amazon (because customs officials must check each book mailed into the country to make sure there is not too much lead in the ink, and they have no budget to do that, thus "protecting" the domestic publishing industry but intellectually impoverishing everyone in the process); Apple can't sell iPhones in Argentina (because they aren't made in South America, which means that scads of tourists entering the country and Argentines returning to the country carry at least one new iPhone for a friend or for resale); and the great majority of Argentines refuse to acknowledge that the Falkland Islands are British (even though they have been a British Protectorate for over 100 years and unanimously voted to remain one not too long ago). Macri—a successful businessman, an advocate of free markets, and a decent person of the sort I wish Trump were—isn't a miracle worker, but he has accomplished more than most would have hoped for so far and he hasn't given up. He knows that Argentina must regain the trust of the world, the rule of law must be the law of the land, and inflation must be brought under control if capital is to return and businesses are to invest and the economy is to grow. The economy is likely continuing to grow at a disappointingly slow pace, but we might see some modestly stronger GDP numbers in the second half as compared to the first half of the year. There are several reasons for sluggish growth, but monetary policy is not one of them. Tax and regulatory burdens are excessively high; confidence is still lacking; and business investment is weak despite strong corporate profits. 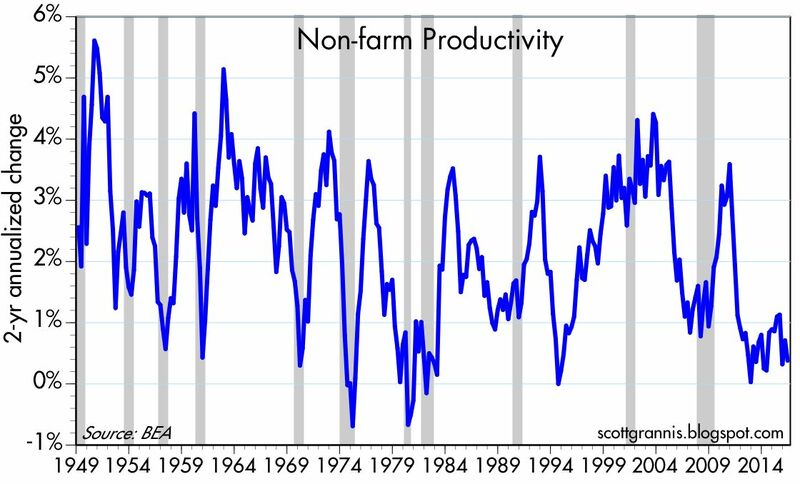 Risk aversion, a lack of confidence, and weak investment have sapped the economy's productivity. More recently, the tremendous uncertainty surrounding the November elections—which could give us even higher tax and regulatory burdens and four more years of sluggish growth under a Clinton presidency, or reduced tax and regulatory burdens and four years of stronger growth under a Trump presidency—is most likely convincing risk-takers that it is better to wait until next year before deciding to undertake new investments, and that in turn is contributing to keep growth weak, especially this year. The Fed has not been "stimulative;" rather, the Fed has been accommodating the world's almost insatiable desire for money and safe assets with its Quantitative Easing program. 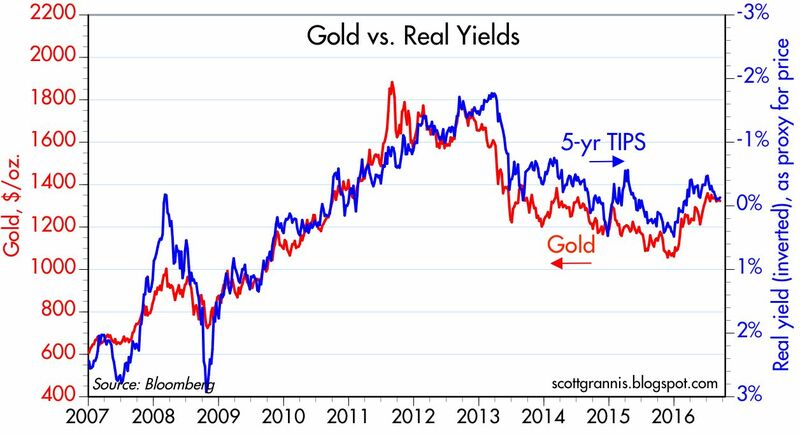 Short-term interest rates are not artificially low, and thus they are not artificially inflating the prices of risk assets and/or bonds. Interest rates are low because the economy is sluggish, inflation is low, and the market holds out very little hope for improvement in the years ahead. 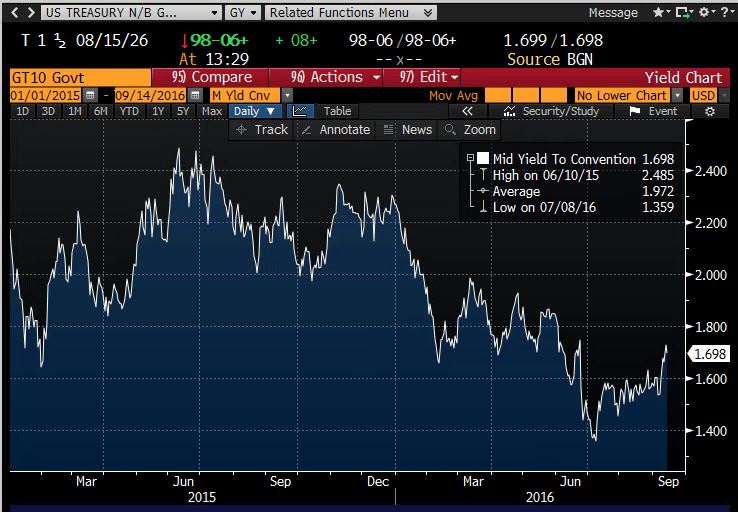 Rates are low because the world's demand for safe assets is very strong. 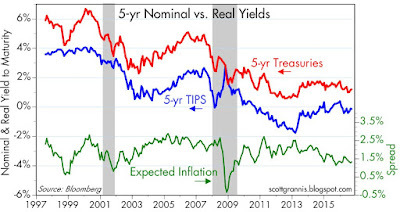 In particular, the very low level of real yields on TIPS, combined with relatively low implied inflation, strongly suggests that the market is very pessimistic about the long-run outlook for economic growth. 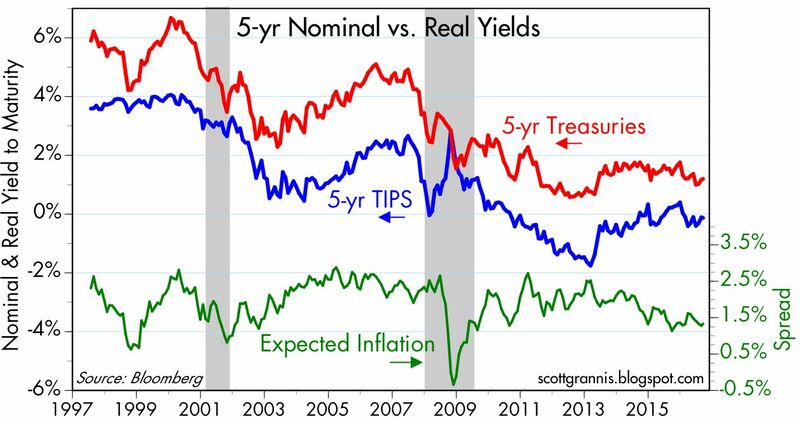 The Fed is not too tight, because real yields are very low and the yield curve is positively sloped. Deflation exists primarily in the durable goods sector, and China has been one of the driving factors behind ever-cheaper prices for the electronics that have boosted our standard of living—there is nothing wrong with that. 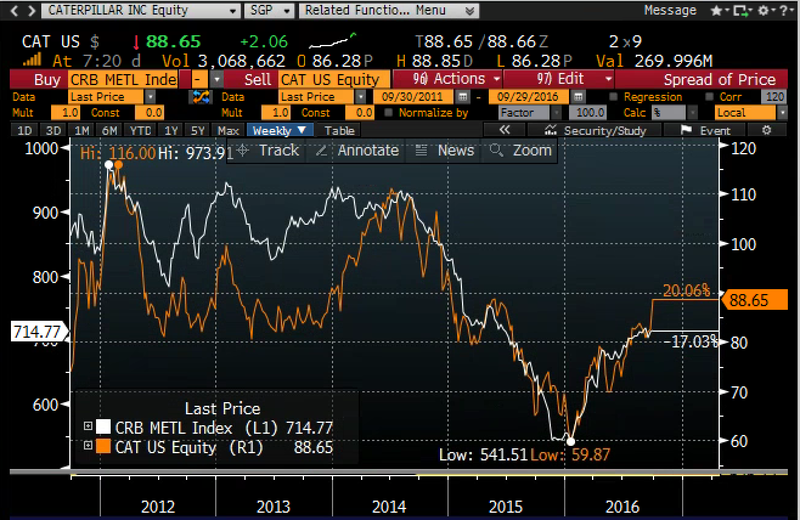 Stocks are no longer cheap, but neither are they obviously expensive. The current PE ratio of the S&P 500 (~20) is above its long-term average, but not excessively high considering how low interest rates are on notes and bonds. Key indicators of systemic risk (particularly swap spreads) are relatively low and stable, and this—combined with the absence of tight money—suggests that the risk of recession is low for the foreseeable future. The unusually wide spread between the yield on cash and the yield on risk assets is a compelling reason to stay invested. The dollar is reasonably valued against most other currencies, according to the Fed's Real Broad Dollar Index, and my analysis of the dollar's PPP value against other major currencies is largely in agreement with this. Raw industrial commodity prices are neither very high nor very low, but they have been trending higher this year and this suggests some firming in the global economic outlook—which, like that of the U.S., has been unimpressive of late, if not a bit troubling. In the meantime, Trump's chances are improving daily and I think the election will soon be his to lose. On Monday I'll be scrambling to find a TV down here that will let me watch the first debate, or, failing that, an internet connection fast enough to live-stream the action. 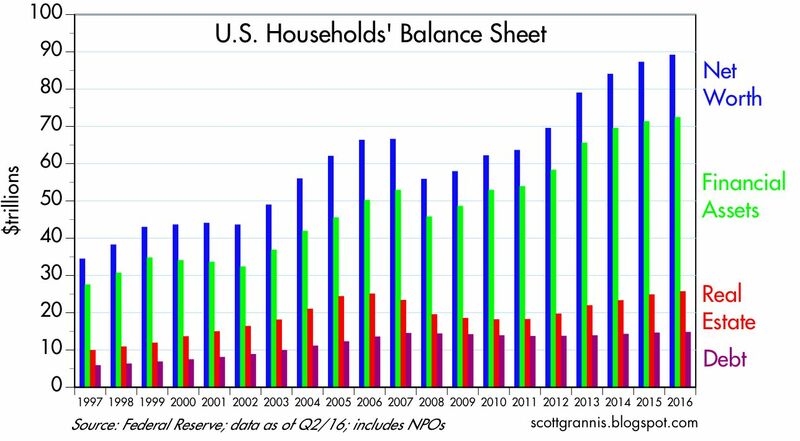 Today the Fed released its Q2/16 estimate of the balance sheets of U.S. households. Collectively, our net worth reached a new high in nominal, real, and per capita terms. We are living in the weakest recovery ever, and things could and should be a lot better, but it is still the case that today we are better off than ever before. As of June 30, 2016, the net worth of U.S. households (including that of Non-Profit Organizations, which exist for the benefit of all) reached a staggering $89.1 trillion. To put that in perspective, it's about 40% more than the value of all global equity markets, which were worth $63 trillion at the end of June, according to Bloomberg. 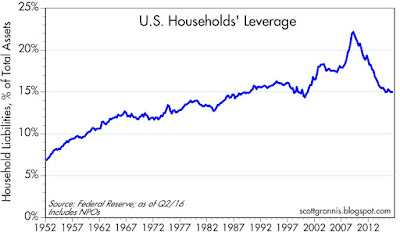 I note that household liabilities have not increased at all since their 2008 peak; the value of real estate holdings now slightly exceeds that of the "bubble" high of 2006; and financial asset holdings have soared since pre-crash levels, thanks to significant gains in savings deposits, bonds, and equities. 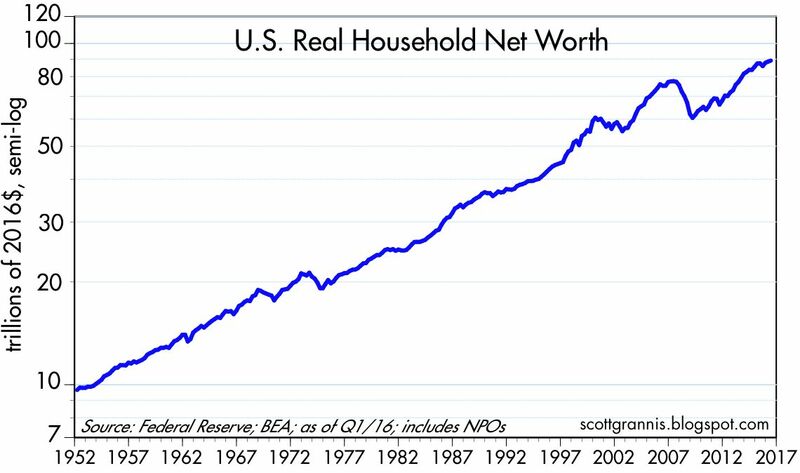 In real terms, household net worth has grown at about a 3.6% annualized rate for the past 65 years. 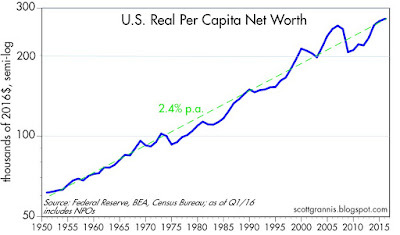 On a real per capita basis (i.e., after adjusting for inflation and population growth), the net worth of the average person living in the U.S.has reached a new all-time high of $277K, up from $62K in 1950. 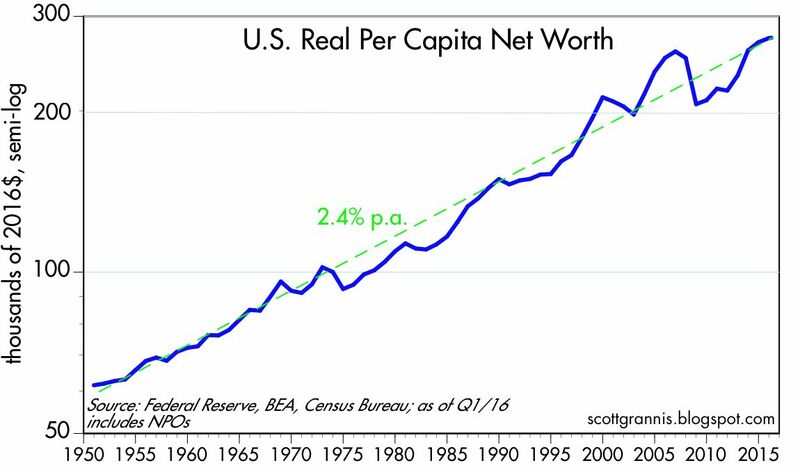 This measure of wealth has been rising, on average, about 2.4% per year since records were first kept beginning in 1951. Life in the U.S. has been getting better and better for generations. The ongoing accumulation of wealth is not a house of cards built on a bulging debt bubble either, regardless of what you might hear from the scaremongers. The typical household has cut its leverage by over 30% (from 22% to 15%) since early 2009. 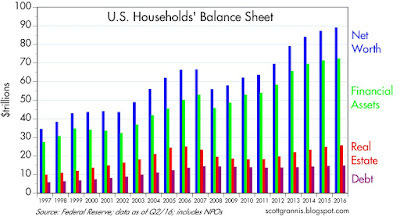 Households have been prudently and impressively strengthening their balance sheets over the past seven years. 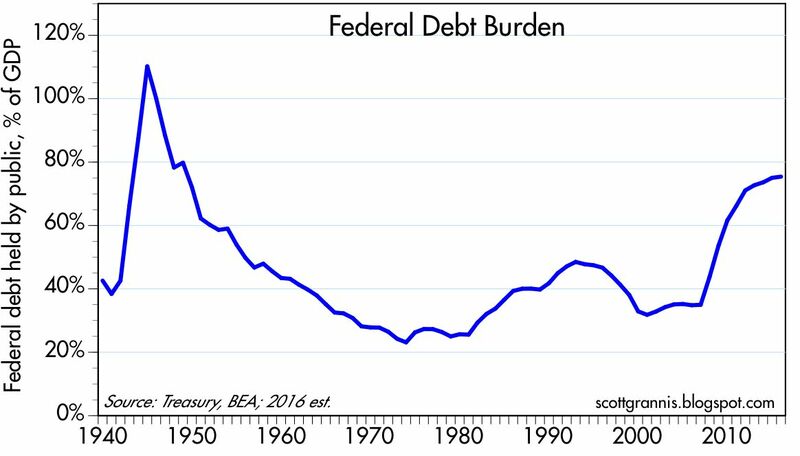 Unfortunately, our Federal government has more than doubled its debt burden over that same period, as I noted in a post earlier this week. 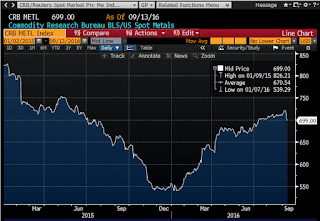 It's interesting that in the past week both stocks and bonds have sold off, since previous selloffs have typically seen stock prices drop while bond prices rose. In today's market, bonds don't serve their traditional role as a hedge against weakness in stocks and/or the economy. What's happening is certainly interesting, if not disturbing (it's always bad when all prices fall). But to be honest I can't find any unifying theme or explanation for what's happening. If I had to give a quick answer, I'd say simply that not much has happened in the past week when viewed from an historical perspective. This may all be much ado about not very much. It does look like stocks have run into another "wall of worry," but it's a pretty minor one according to the chart above. The Vix index jumped from a low of 12 to a high of just over 20 in the past week (indicating increased fear and uncertainty), but this was offset by a rise in 10-yr yields from 1.5% to 1.7% (which might possibly mean the market is less pessimistic about the economy's ability to grow, which is not necessarily a bad thing at all). In any event, stock prices so far have only dipped modestly, and that tends to happen quite often in fact. Real yields are up almost 40 bps in the past few months (a sign that the market is more optimistic about the economy's ability to grow), but they haven't changed much at all in the past week. Gold prices are down a bit in the past week and they have been relatively flat for the past few months. 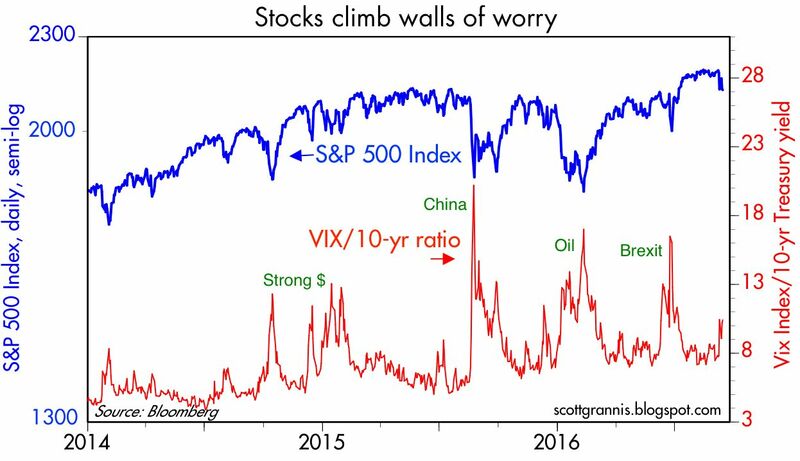 Together they signal that the market is slightly less pessimistic or slightly less concerned about disturbing things happening in the future. But it's hard to build a big case around these modest changes. 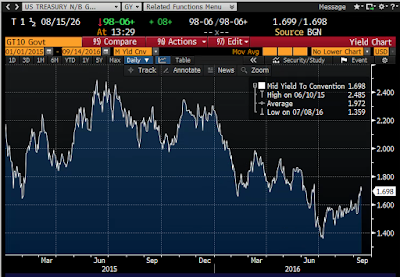 10-yr Treasury yields, shown in the chart above, have indeed jumped in the past week and in the past few months. But they are still quite low relative to where they've been in the past year or so. If anything, I'd say this shows the market has become slightly less worried about weak economic growth—less worried than it was in the immediate aftermath of Brexit, which occurred in late June. The chart above compares 5-yr Treasury yields to 5-yr TIPS yields; the difference between the two is the market's expectation for what the CPI is going to average over the next 5 years. 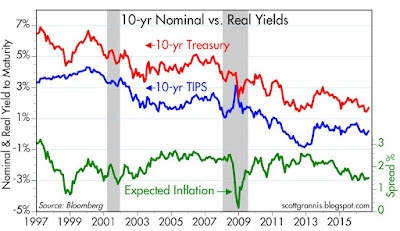 Inflation expectations are relatively low, and they haven't changed much at all of late. We're not in the presence of anything like an inflation scare. The economy remains in slow-growth mode and the market is priced to a 20% chance the Fed will raise rates next week. This is not a Fed-related panic. Why should the Fed push rates up if the economy is weak and inflation expectations are low and stable? 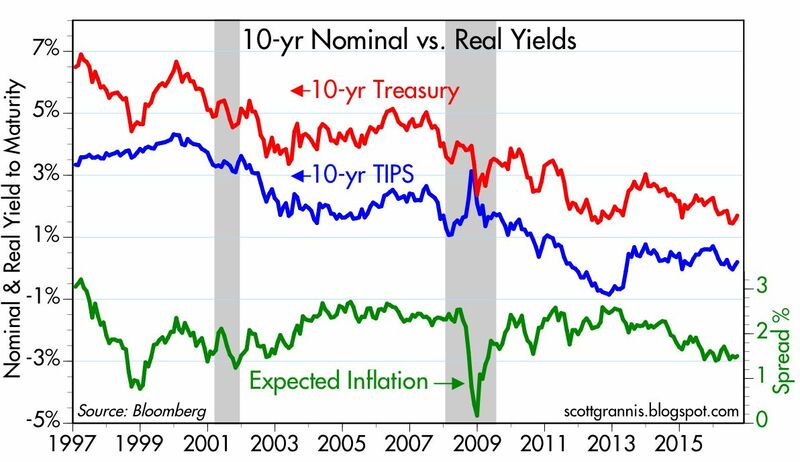 The chart above compares 10-yr Treasury and 10-yr TIPS yields, and the market's expectation for what the CPI will average over the next 10 years: a very modest 1.5%. Nothing much going on here. 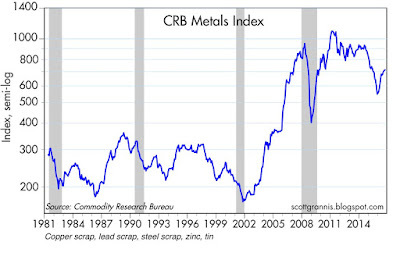 The chart above shows the CRB Metals Index. It fell a bit in the past week, but it is still up almost 30% since the end of last year. 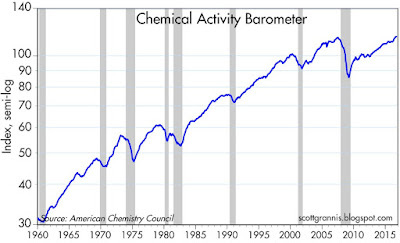 If anything, this says that global economic fundamentals have firmed a bit year to date, and that's encouraging. Given the revelations about Hillary Clinton's health in recent days, it's not surprising that her poll numbers have weakened. Trump has managed to become a bit more presidential of late, and a bit less off-the-wall, so it's not surprising that his poll numbers have improved. 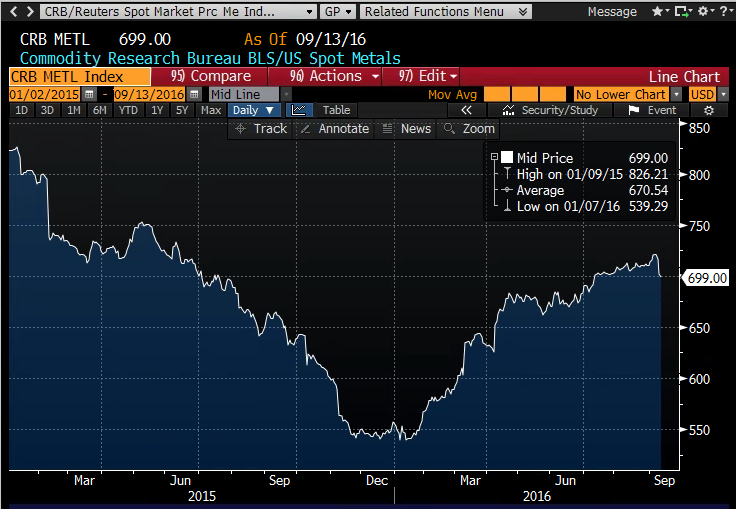 But I don't think we're yet at the point where the market is going to start pricing in a Trump victory. Hillary is still the odds-on favorite, though not by as much as she was a few weeks ago. Regardless, the outlook for changes in fiscal and regulatory policy remains highly uncertain at this point, as I noted early last week. In the presence of uncertainty, economic actors are more likely than not to postpone major investment decisions, and that is going to keep the economy weak for the time being (although it wouldn't be surprising to see third quarter GDP come in a bit stronger than first and second quarter). And even if Trump's prospects improve dramatically, I don't think the market is going to be quick to conclude that a Trump presidency promises a vigorous economy. If anything, the likelihood of a Trump presidency could unnerve many people all over the globe. Until, that is, it becomes clear that he is bound and determined to lift the burdens of taxation and regulation that have been acting like a ball and chain around the economy's legs for the past seven years. And even if it becomes clear that Trump will win and will pursue healthy tax and regulatory reform, the prospect of a stronger economy brings with it the likelihood of a significant rise in interest rates. It's going to take the market a while before it embraces the notion that stronger growth, rising profits, and higher interest rates are all of a piece. I've argued for years that higher rates won't threaten growth, because they will be the by-product of stronger growth. I have also argued for years that stock prices have not been inflated by "easy money" or artificially low interest rates, because the Fed hasn't been pushing rates down; the Fed has been lowering interest rates in response to a weak economy, lots of risk aversion, and strong demand for money. Thus it's logical to conclude that a stronger economy, declining risk aversion, and falling demand for money would all go hand in hand with higher interest rates. 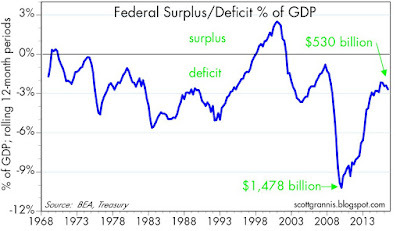 A stronger economy would also mean a lower deficit, and that would mitigate the impact of rising rates on the federal government's debt burden. In short, I'm not worried about the implications of a Trump win, but it might take the market awhile to digest it. 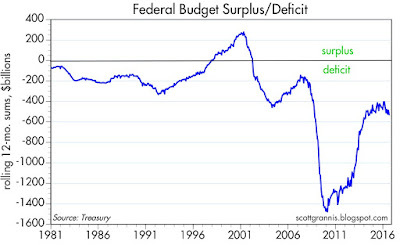 The deterioration of the federal budget began in slow fashion over a year ago, and it's now become obvious. It's not terrible, but it's no longer salutary. 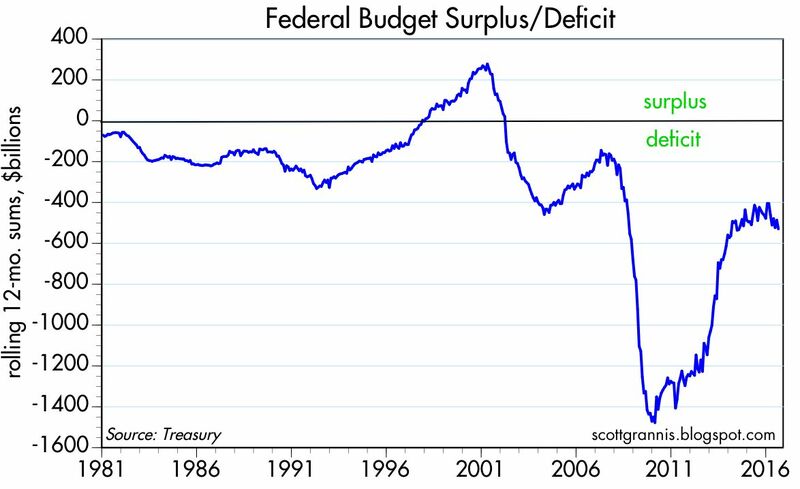 The budget deficit hit a cycle low of just over $400 billion in the 12 months ended May, 2015, and as of last month it had grown to $530 billion. 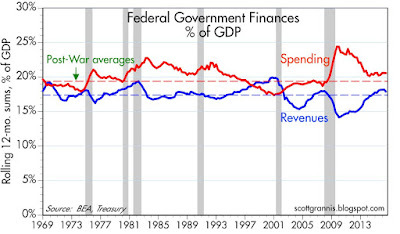 The deficit is still quite manageable at 2.6% of GDP, but spending is firming while revenues are stagnating. The public sector is growing while the private sector struggles. This has contributed to the slowdown in economic we have observed so far this year. 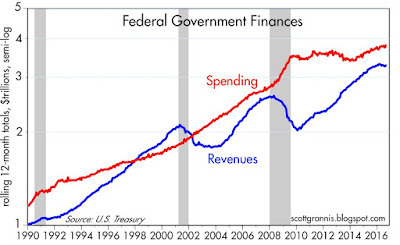 Since 1990, federal government spending has increased 230%, more than tripling in size. Revenues have increased by almost the same amount (228%). 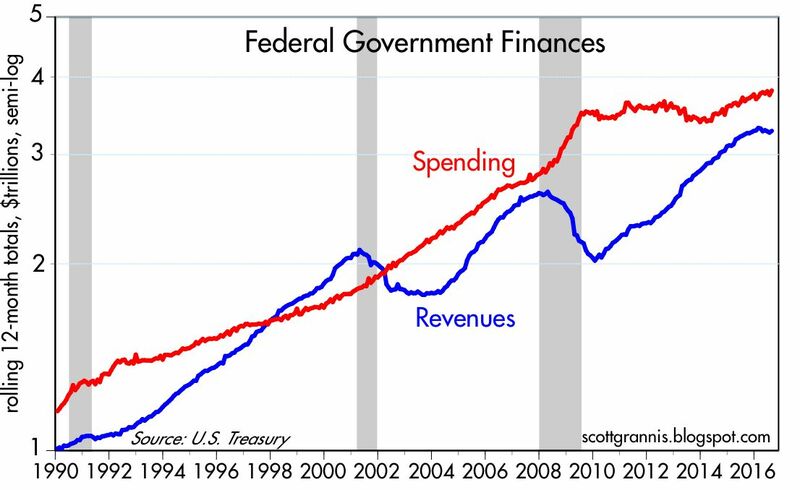 It's a testament to the amazing growth of the economy that federal spending and revenues over the decades have grown by about the same pace as the economy (i.e., both the lines in the above chart show a relatively flat trend). 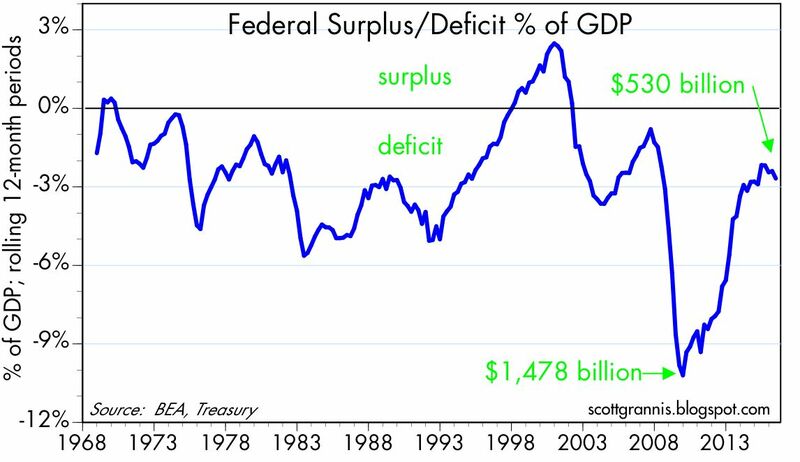 The current budget deficit, relative to the economy, is very much in line with what it has averaged over the postwar period. 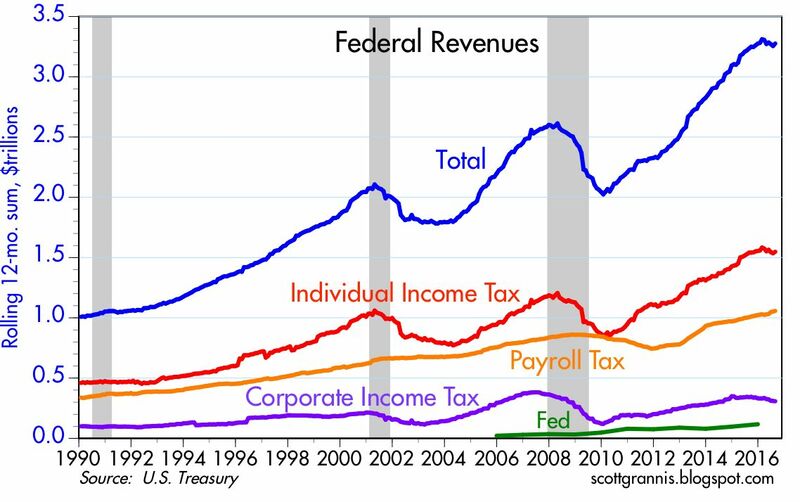 Revenues from estate and gift taxes are not included in the chart above, since they totaled a paltry $21.4 billion in the last 12 months, and represented only 0.6% of total federal revenues for the period. This is the equivalent of a rounding error for the federal government, yet it sustains an army of lawyers and accountants that could be more productively employed doing things other than avoiding the payment of sums that successful citizens are reluctant to part with, having already paid income tax and corporate tax at least once in the building of their estates. 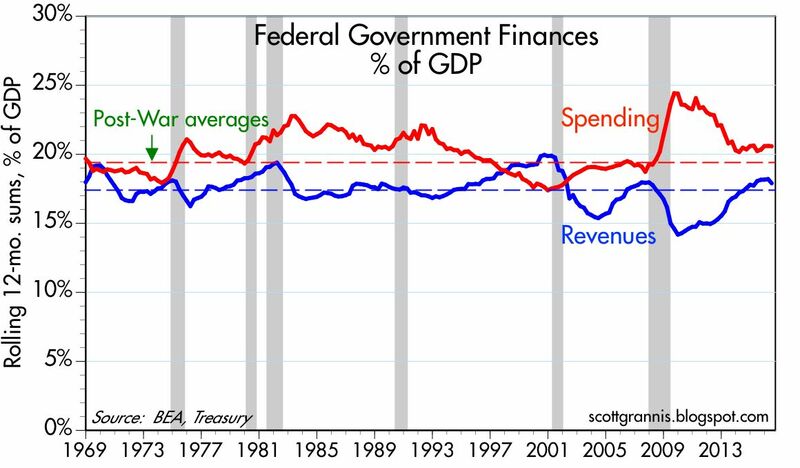 UPDATE: The chart below shows the Federal Debt Burden, which is Treasury Debt Held by the Public (currently $14.1 trillion) divided by nominal GDP (currently about $18.5 trillion). It's been higher than today's 76% before, but only as a result of the heavy borrowing needed to finance WWII expenditures. 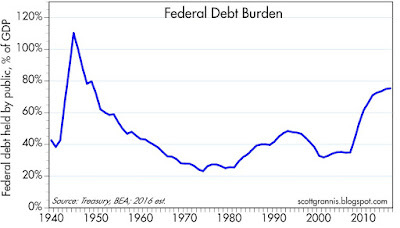 Following the end of the war, the debt burden declined rapidly as the economy expanded rapidly and spending fell. Things don't look as promising now as they did then. Many economists have said that the debt burden becomes scary only after it exceeds 100% of GDP. But even then, one can point to Japan and Italy, where debt burdens are well in excess of 100% of GDP and economic life goes on. Whether debt is a real problem depends on a lot of variables. For now it looks like we are still within the range of "salvation," provided the economy is able to grow more rapidly in the years ahead and entitlement spending is curbed. But there are still a lot of "ifs" to consider. Last week an anonymous author penned a provocative but well-written essay, "The Flight 93 Election," that makes the case for Trump. Today he followed up with an equally well-written essay in his defense (he has been roundly attacked by both the left and the right) that reinforces the case for Trump, "Restatement on Flight 93." I should warn that both essays are long. But they are the most intellectually persuasive essays in support of Trump that I am aware of (and there aren't many). Love him or hate him, and for all his myriad flaws, you owe it to yourself to view Trump from this author's unique perspective. One of the dumber things often said about Trump is that “you can’t trust him with the nuclear codes.” This statement, first, betrays a complete lack of understanding of nuclear command and control. More important, it’s an extraordinary calumny, one that accuses the man of a wish or propensity to commit mass murder on the scale of Pol Pot. On what basis does anyone make such an accusation? Can Trump be erratic, obnoxious, and offensive? Of course, he can be all that and more. But while these qualities are not virtues, they may well have helped him punch through the Overton Window, in which case I am willing to make allowances. The August jobs report was disappointing, since it confirmed that the economy has downshifted from the 2 – 2 1/2 % annual rates of growth that prevailed from mid-2009 until earlier this year. 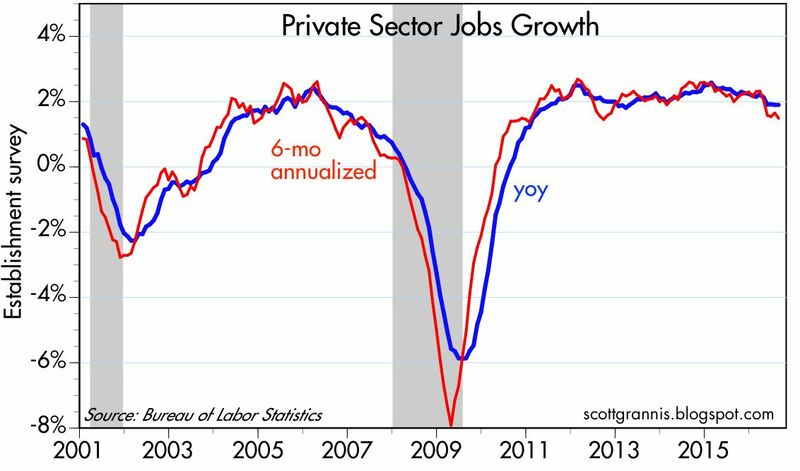 With private sector jobs having increased at a 1.5% annualized rate over the past six months, and with productivity running around zero or less, the economy is on track to grow at a miserably slow 1 ½ % rate in what’s left of the year. What might account for the downshift? Risk aversion—which has played a prominent role in the economy since the 2008 financial crisis—is certainly a factor, as is weak business investment. But more recently, I would argue, it’s due to businesses sizing up the prospects for policy in the coming years. There’s little or no incentive for anyone to take on extra risks right now. Let me explain why. Hillary Clinton and Donald Trump are a study in contrasts. She wants to double-down on Obama’s policies—higher taxes, more regulation, and more income redistribution—despite those policies being the most likely culprits for the miserably slow growth of the past seven years. She believes that government can redirect the economy’s scarce resources and thereby create more jobs and growth in the process. Being a businessman, Trump understands that people and businesses respond to incentives. He proposes to slash corporate taxes and reduce regulatory burdens in order to incentivize job creation and make it easier to start and run a business. Clinton believes in the power of government—despite its many and manifest failures—while Trump believes in the power of market forces and free enterprise, which over the years and across many countries have proven to be the true engines of prosperity. If you agree with me, then it should be easy to see what ails the economy these days. Put yourself in the shoes of a corporate executive who this year is contemplating creating a new business or expanding an existing one. You figure that tax and regulatory burdens are unlikely to change for the better under a Clinton presidency, but they could improve significantly under a Trump presidency. Let’s stipulate that Hillary has a 65% chance of winning, and Trump a 35% chance. That means there is a 65% chance of things staying the same or getting worse (a lot depends on whether the Republicans retain control of Congress), and a 35% chance of some significant improvement—in particular a substantial increase in the after-tax rewards to working harder and taking on additional risk. A 15% business tax rate coupled with incentives for repatriating offshore profits (which Trump is proposing) could profoundly change the attractiveness of new investment. The odds favor no improvement, but should Trump win—which at this point is within the range of possibility—things could get a lot better starting sometime next year. Would you move ahead today with a new investment, or would you prefer to sit back and wait to see what happens? If it were me, I would wait. I can’t see conditions deteriorating significantly under a Hillary administration, since I believe that there is enough support in Washington for a reduction in corporate taxes to ensure that at the very least taxes don’t go up. But even if Hillary were to push through every one of her awful ideas, I’d be better off waiting, because if bad things were to happen, I could just pull the plug on that new project and end up doing nothing. On the other hand, if policies were to become more business-friendly next year, I could quickly decide to take the plunge and invest. Hope for the best, but prepare for the worst, as they say. In short, there is no incentive for businesses to take on new, risky ventures this year, and every reason for businesses to wait until next year to decide. The uncertainties this year are enormous, and economic actors don’t like to make decisions in such a climate—it’s that simple. I think this explains why business investment has been weak and why jobs growth has slowed this year. 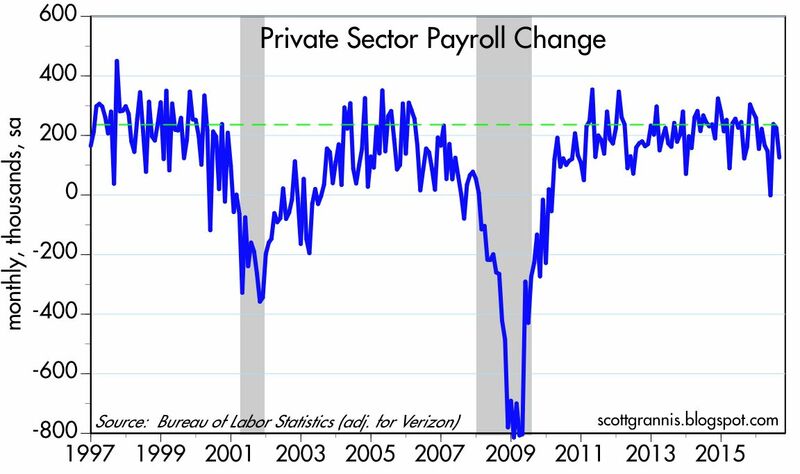 The monthly change in private sector jobs (the only ones that really count) has averaged only 150K over the past six months. 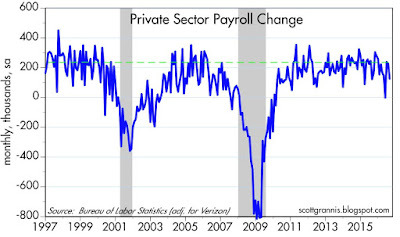 That translates into an annualized change of 1.5%, down from a high of 2.6% two years ago. 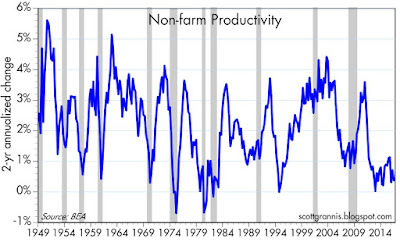 Labor productivity has been miserably low for several years now, with no sign of improvement. 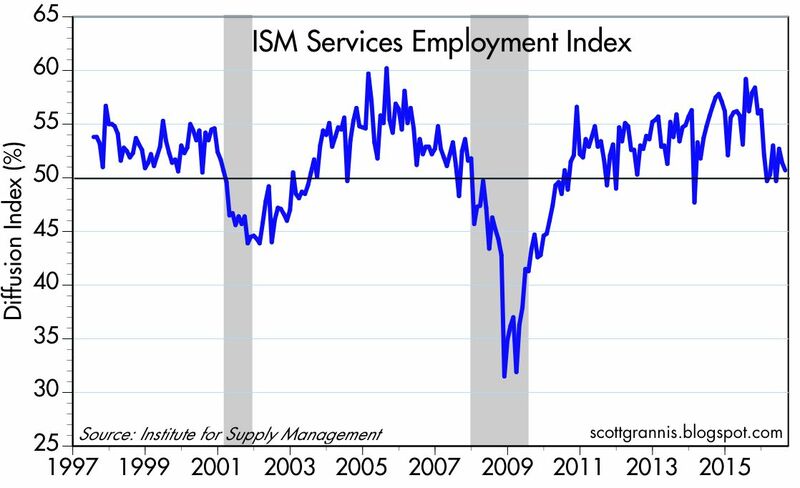 UPDATE: The charts below, updated for today's release of the August ISM service sector indices, also confirm the economy has downshifted this year. Business activity has softened and hiring plans have been scaled back. Think about this another way: if you thought that income and capital gains taxes had a 35% chance of being cut meaningfully next year, but were very unlikely to rise, how eager would you be to sell a highly appreciated asset today? The rewards to waiting might be significant. Taxes matter.